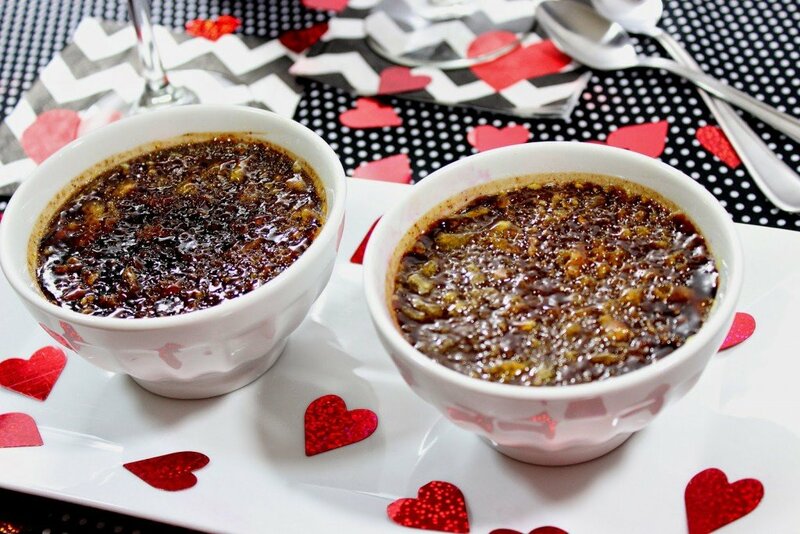 Chocolate Espresso Creme Brulée is the perfect dessert to share with your Valentine. It’s thick and creamy with a crunchy sugar topping that will make your heart swoon and your pulse race. 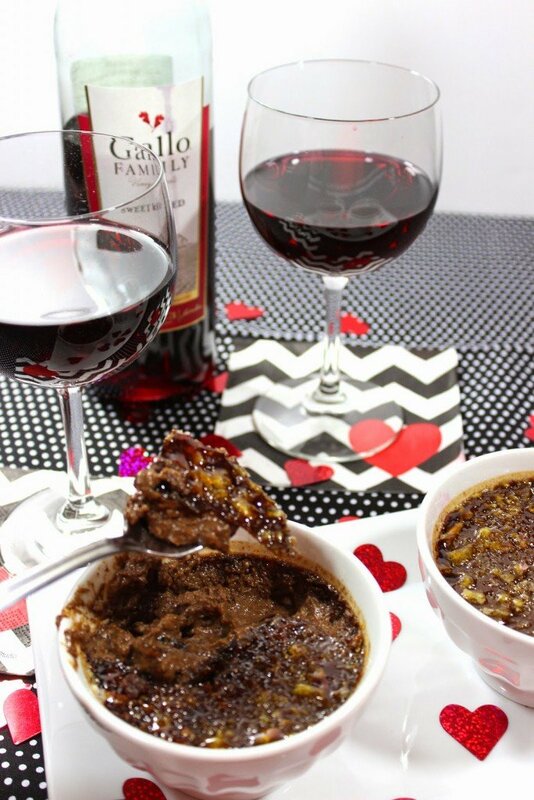 When I think of a romantic Valentine’s dessert, I can’t help but think of Chocolate Espresso Creme Brulee that been lovingly prepared and paired with Gallo Family Vineyard’s Sweet Red Wine. Imagine sitting on a blanket by a roaring fire with the love light flickering. You both take your wine glasses, intertwine your arms, and make a toast to what you love about each other. You sip. You savor. And then you both take your spoons and crack into the sugary glass-like coating that covers the silkiest and smooth chocolate espresso creme brulee you’ve ever tasted. You feed each other. One spoonful, two spoonfuls. One swoon. Two swoons. The light hint of espresso in the creamy creme brulee matches perfectly with the richness of the chocolate. You both sip the sweet red wine. One sip. Two sips. The sweet red Gallo wine is the kiss on your lips, at the end of the night you’ve dreamt about all day long! Throughout the years, my husband and I have never been big on the “traditional” Valentine’s Day celebrations. I think I can count on one hand the times we went out to celebrate at a restaurant, and those days were before we had kids. While we have both always enjoyed going out to eat a good meal at a restaurant, there always seems to be too much pressure (not to mention the crowds) on Valentine’s day itself. It’s that reason alone that we’ve always celebrated at home with an extravagant home cooked meal and a luscious dessert. When our kids were little, dinner and desserts were always tailored to their tastes and preferences. A box of heart chocolates, a little Valentine themed toy or a mylar balloon always garnished their dinner plates and the dinner table. The memories I have of those times are priceless. If I could step back in time to those days, I would do it in a heartbeat. 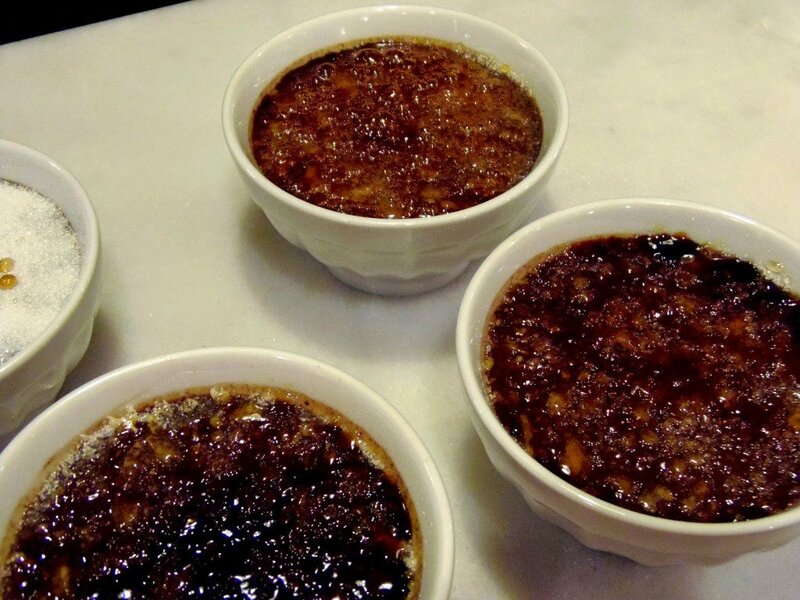 If you’ve never made creme brulée before, please don’t be intimidated by it. It’s super simple to make, and the crunchy sugar coating on top can be made by placing the cooked creme brulée under the broiler until the sugar caramelizes and melts. Or, you can use a handy dandy kitchen blow torch (like I did) that only adds to the fun and excitement of this memorable dessert. Either way, I urge you to make this recipe and share it with someone you love this Valentine’s Day! 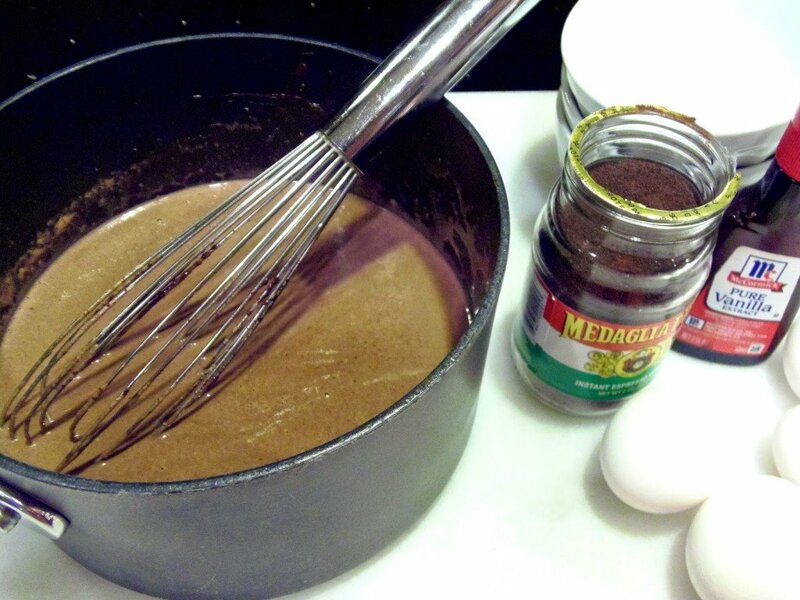 -In a medium saucepan, combine the cream and espresso powder. 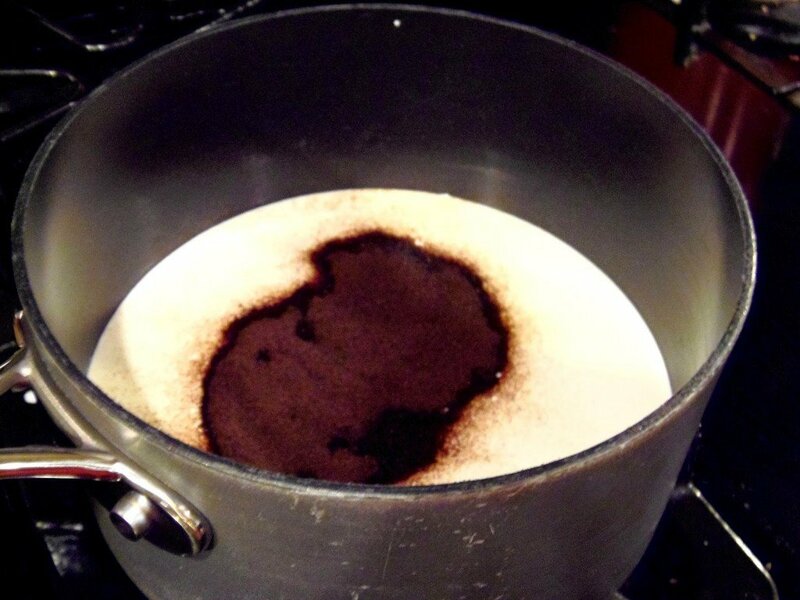 Bring to a simmer, shicking to dissolve the espresso powder. Remove from heat. 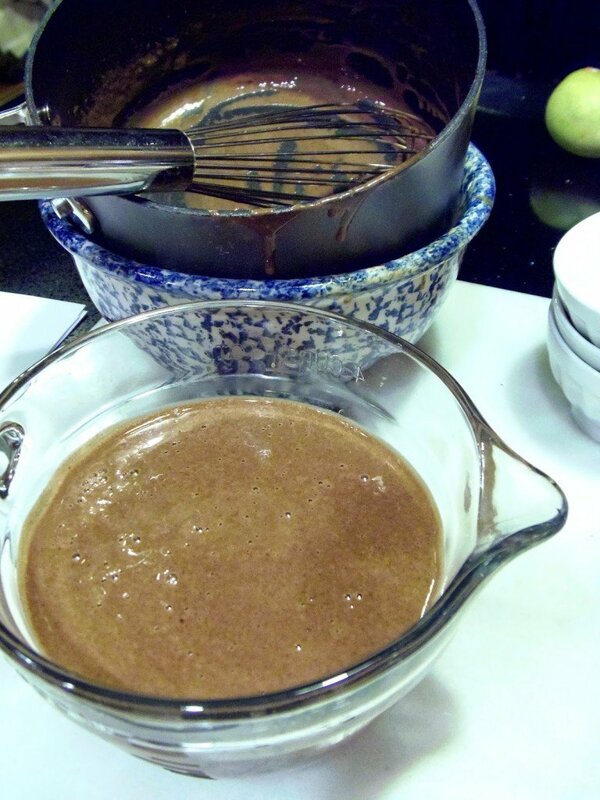 -Add the chopped chocolate to the hot cream and whisk until smooth and melted. -In a large bowl, whisk the egg yolks, 3 tablespoons sugar and vanilla until well blended. -Stir 3 tablespoons of the hot cream mixture into the egg yolk mixture (to temper the eggs so they don’t scramble) and then pour the remaining cream mixture into the egg yolk mixture and whisk to combine. -Divide the creme bruée mixtue evenly amont 4 ramekins or custard cups. Place the cups into a large oven proof dish and fill the dish with boiling hot water (also known as a bain marie) that reaches about half way up the ramekins. Being careful not to pour any of the the hot water into the remekins themselves. -Bake the creme brulé in a preheated oven until the egfes are set but the center is still a little loose (approximately 50 minutes). 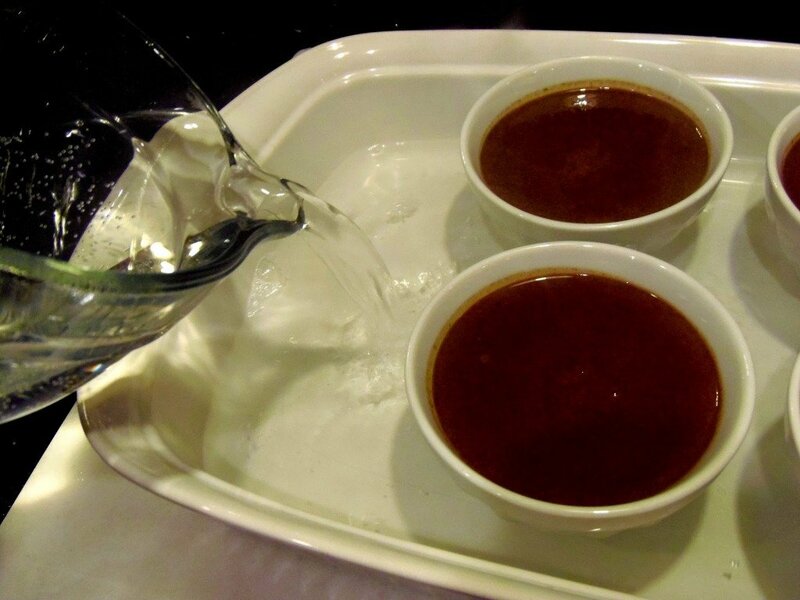 -Carefully remove the cups from the water bath and allow the custard to cool slightly. 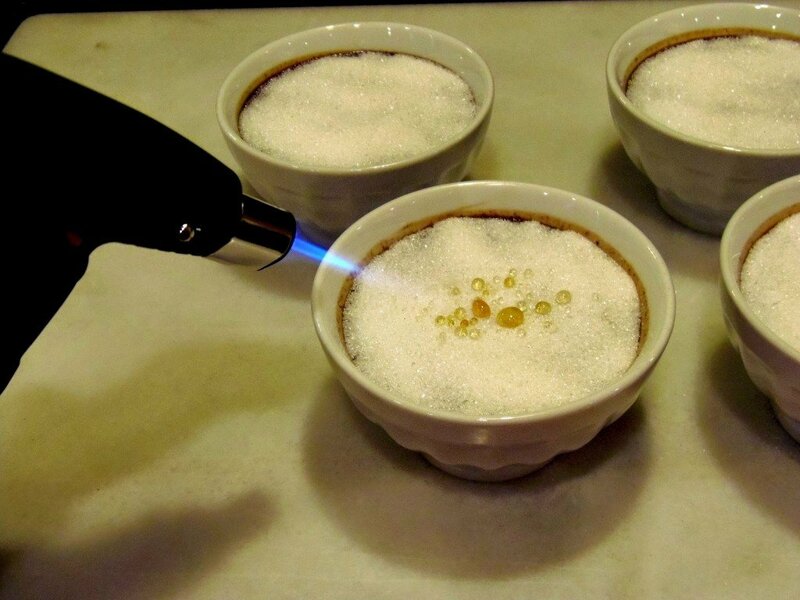 -Meanwhile, top each creme brulée with 1 tablespoon sugar and place them under the broiler to caramealize or use a kitchen blowtorch to caramelize the sugar. Cool slightly before serving. -These custerds can be served warm or chilled. 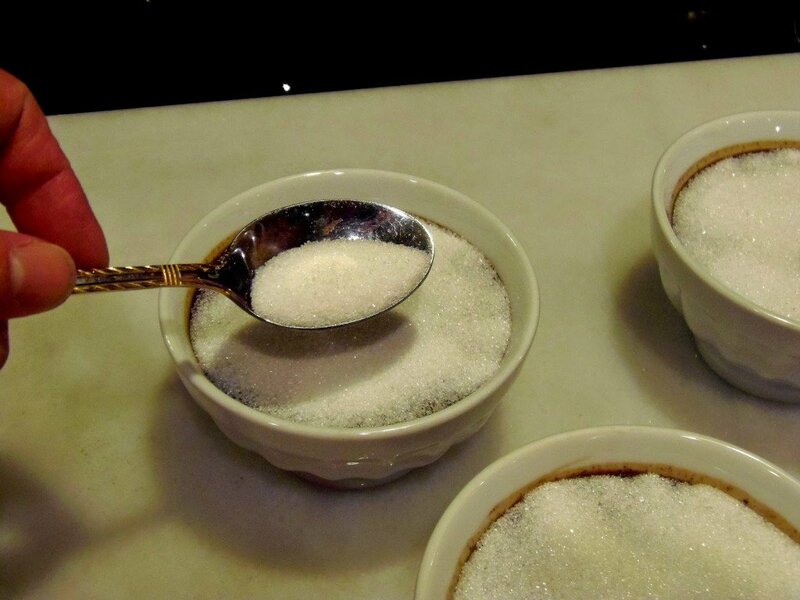 Chill for no longer than two days in the refrigerator or the sugar topping will become soft. 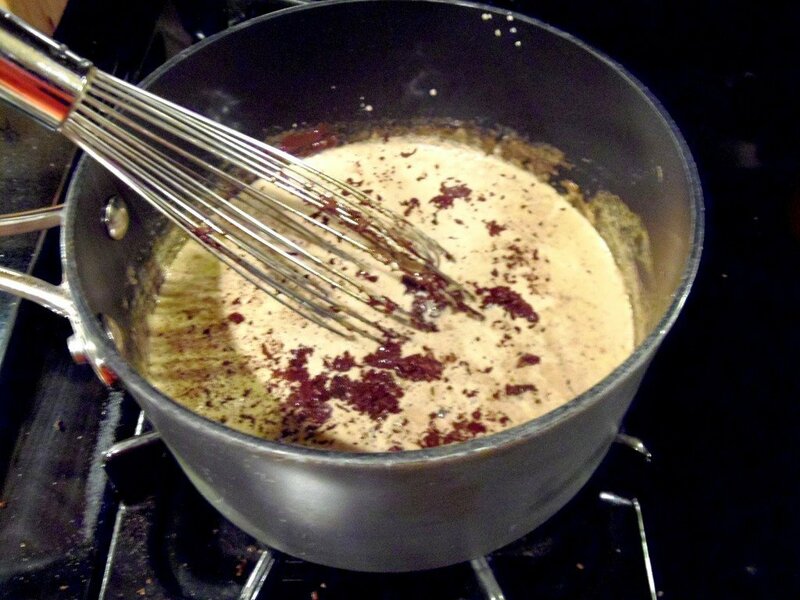 Heat the heavy cream and espresso powder in a saucepan, whisking to combine. 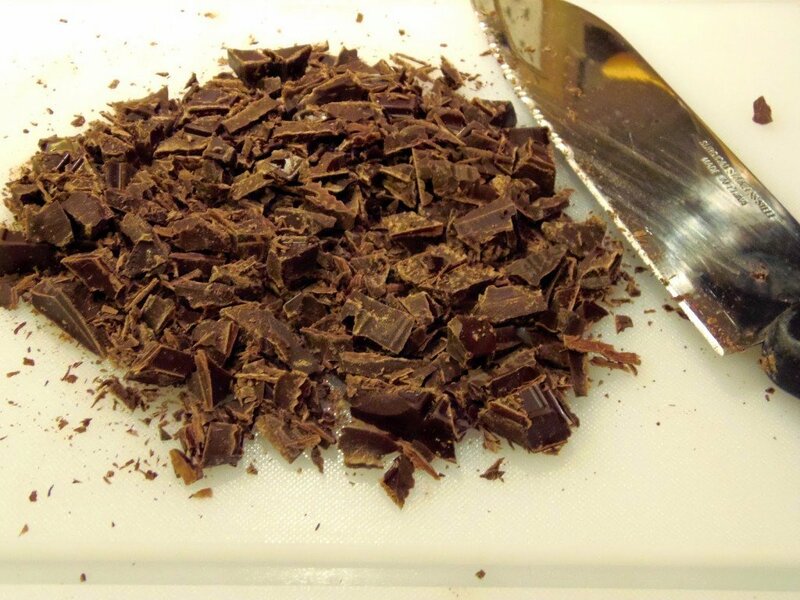 Add the chopped chocolate and whisk until smooth. Remove from heat. 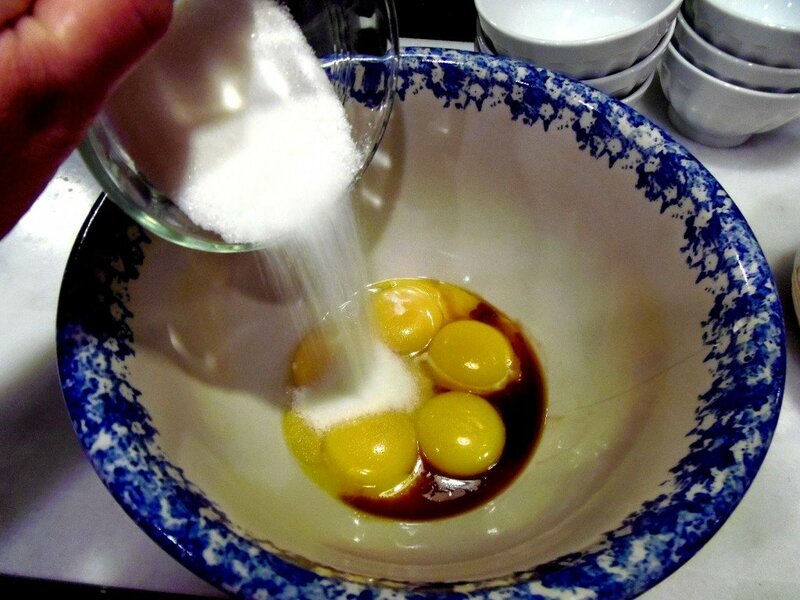 In a medium bowl, whisk together the egg yolks, sugar and vanilla. Temper the egg yolk mixture by adding 3 tablespoons of the hot cream into the egg yolks. Whisk to combine. 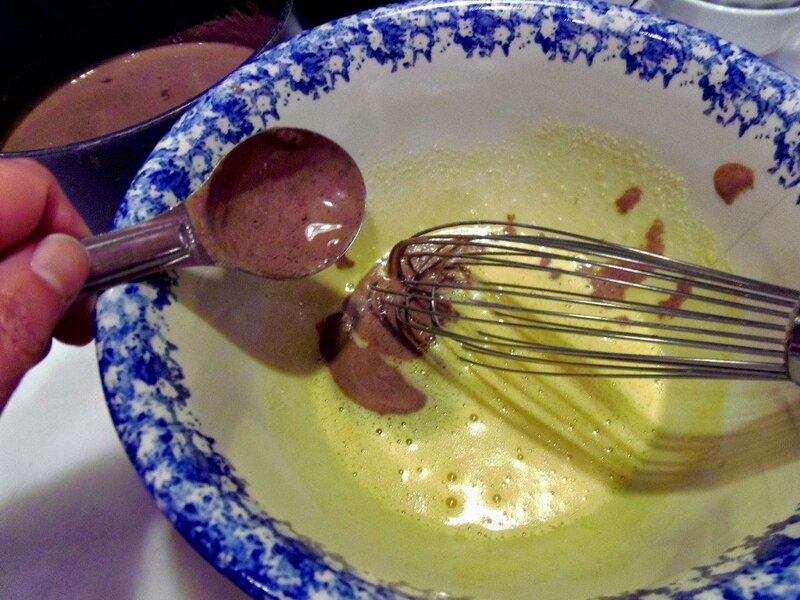 Pour the remaining hot cream mixture into the egg mixture. If desired, pour the custard mixture into something with a pour spout to make it easier to fill the custard cups. Fill 4 custard cups (ramekins) with the custard mixture. Place the ramekins into a large oven proof pan and fill the pan half way full with boiling water making sure not to get any water into the ramekins. Carefully place the pan into a preheated 300 degree oven and bake until the outer edges of the custards are set but the inside is still slightly loose. Cool slightly and then sprinkle 1 tablespoon sugar evenly over each custard. 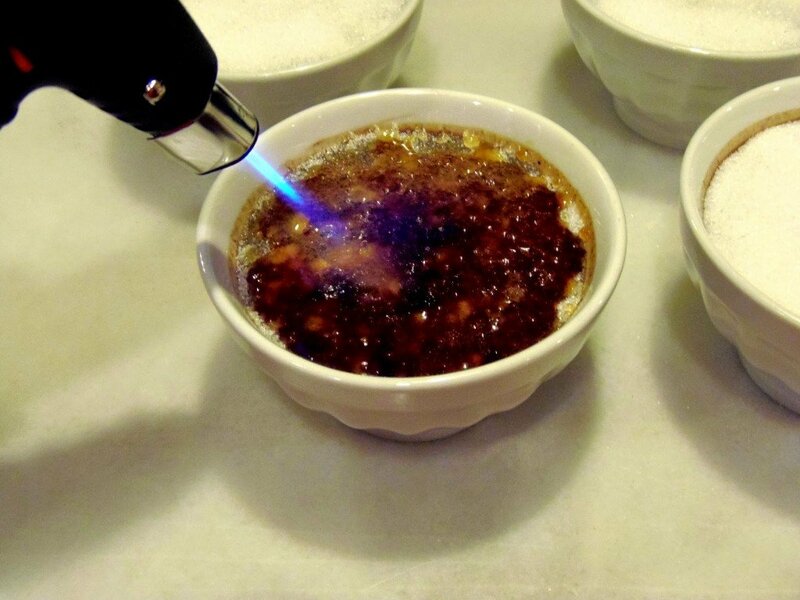 Place the creme Brulée under the broiler to caramelize or use a small kitchen blow torch to melt and caramelize the sugar. Cool slightly and serve warm or cool. 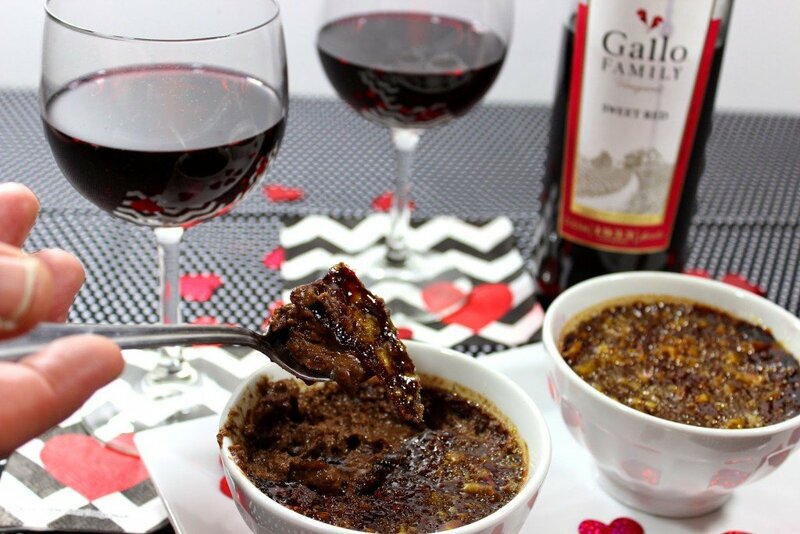 If you’ve not yet tried Gallo’s Sweet Red Wine and are wondering how it tastes, it’s bursting with flavors of red fruit, black cherry and raspberry jam. Coupled with a fresh, fruity acidity and followed with a velvety soft finish this wine is easy to enjoy, especially chilled. The soft dark berries and lush sweetness match perfectly with smoked meats and barbecue sauce, as well as dessert. Learn more about Gallo Family Vineyard’s Riesling and Sweet Red wines, and while your there make sure to visit their wine blog and store locator for information on where you can purchase each variety. For further information about Gallo Family Vineyards, I urge you to follow them on Twitter, Facebook, Instagram and YouTube. On behalf of Gallo’s family and mine, Happy Valentine’s Day! 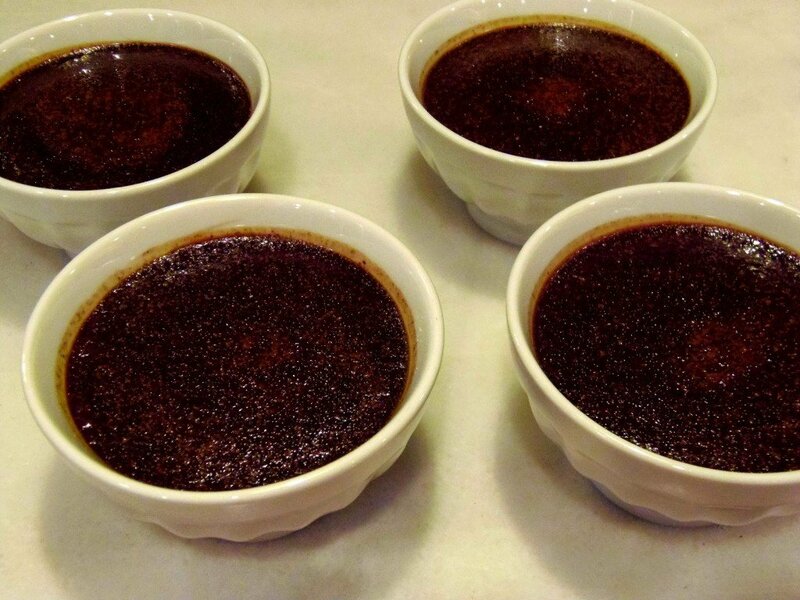 Can you believe I've never made a dark chocolate creme brulee? That has GOT to change! What a terrific V-Day dessert!!! So would it be bad thing if I made this and kept it all for myself? Yea, I know… mighty selfish and not what one should do for Valentine's Day. Wow! I have always wanted to make Creme Brulee! Yours is simply perfect! For years, I ordered creme brûlée anytime I saw it on the menu. It didn't even matter if I was still hungry – which truthfully has nothing to do with eating dessert anyway. But in all those years, I don't think I ever had a dark chocolate one! I missed out! I would LOVE it. Oh how I need this delicious creme brulee in my life…I love the flavor combination! Ph boy. This is making my heart pitter patter 🙂 Looks divine! Now that is the perfect description of a Valentine's Day scene! And these brûlées are everything that a Valentine's dessert should be. I have been thinking about this deliciousness since you first posted the title and I can't wait to make it. Looks amazing. This creme brûlée is perfect! I love making a homemade meal on valentines day too, it's so much better than getting disappointed at a nice restaurant that's so busy they inevitably make mistakes. Will you be my Valentine? Love the chocolate! I have never made creme brulee! I want too, it's been on my foodie bucket list forever! The flavors of yours so wonderful! I love creme brulee! I have only ever made it once and it was less than stellar…haha. We ran out of ramekins so we put the rest of the cream mixture in a 8×8 pan and made one super giant creme brulee…lol. Your version looks to have turned out perfect! creme brulee is my favorite dessert. And coffee is just my favorite. So yeah, I'm totally loving this! This is a great Valentine's Day dessert! I have actually never made creme brulee before! What a stunning dessert. 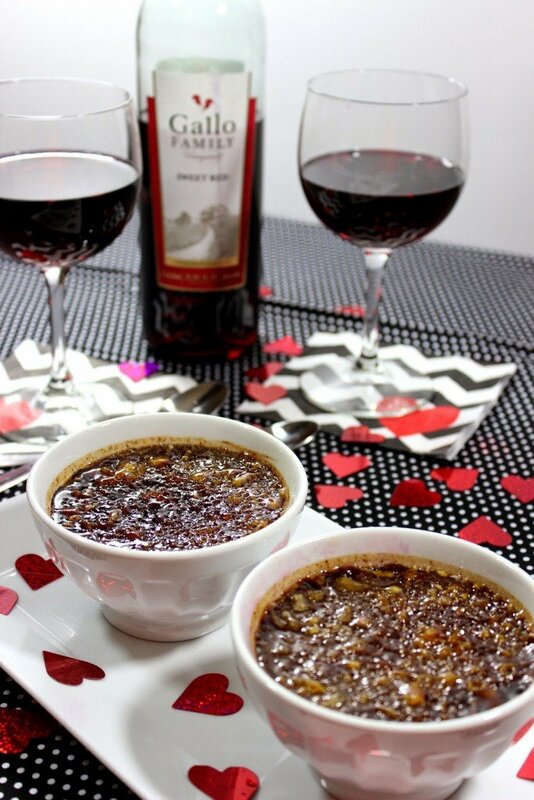 I've never made creme brulee, but I know my husband would love it if I did! Maybe one day… and when that day comes I'll come back to this recipe! Creme Brûlée is one of my absolute favorite desserts. Oh yes, that is exactly what Valentine's Day is supposed to taste like! I love creme brulee almost more than any other dessert….it makes me giddy to crack through that top. This looks so darn good! Such a wonderful flavor combo! Love it! That IS what Valentines is suppose to feel like! I bet this Chocolate Espresso Creme Brulee is way better than regular creme brulee! Mmmm that wine looks good! Creme Brulee is my out to dinner treat…so I won't make it, lol! If I did, I would never leave the house! I've never made creme brulee before. I think it's because I've been waiting for THIS recipe! I can't wait to try it!!!!!!!!! My hubby would love his one. He's a big coffee guy. I love creme brulee, there is something about the sound of that first crack as you break the seal. It just makes me so happy. I'm like you guys, I am not into all the traditional valentines stuff. I hate crowds so I would much rather stay home, order in and rent a movie. That's romance for me. Even better if I get to stay in my jammies. 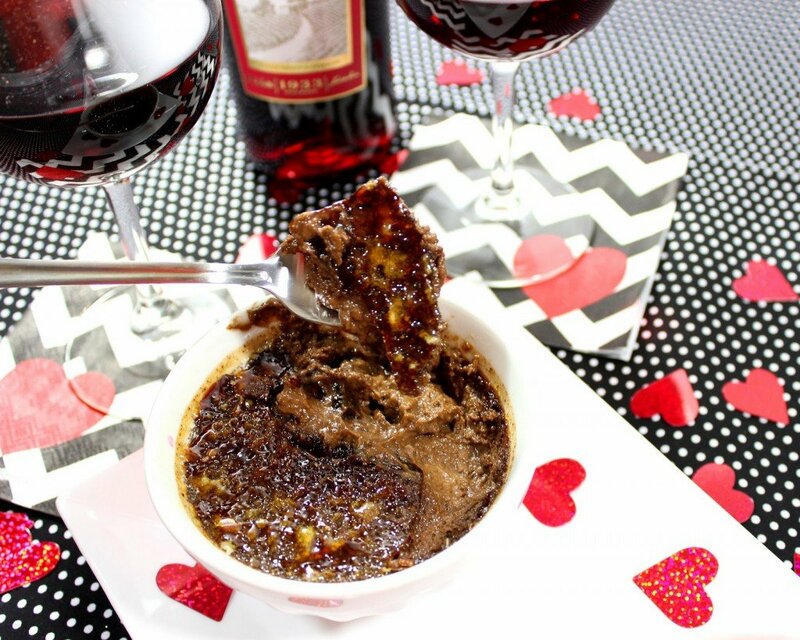 This sounds heavenly, my first Valentine's Day dessert fail was a creme brûlée….I have yet to make it again since then. (15 years ago.) This may just be the one that gets me back on the horse! Renee, you should write romance novels 😉 I love your little scenario! Creme brûlée is such an exquisite choice for a dessert! I have never made one but after reading through your post, I'm positive I would be able to make one at home!